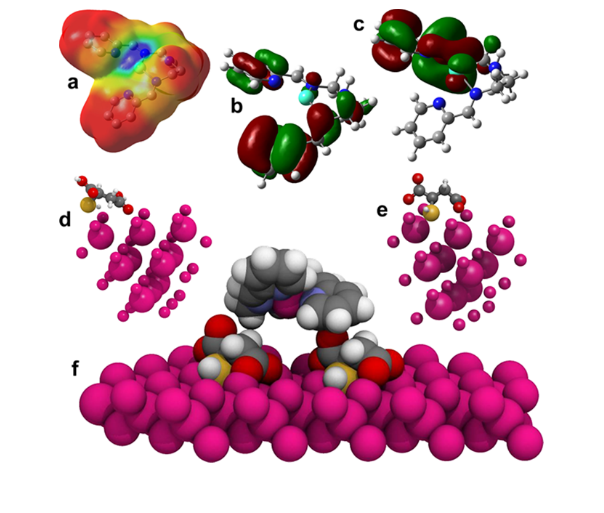 Two new papers on the development of chemosensors for different applications were recently published and we had the opportunity to participate in both with the calculation of electronic interactions. A chemosensor requires to have a measurable response and calculating either that response from first principles based on the electronic structure, or calculating another physicochemical property related to the response are useful strategies in their molecular design. Additionally, electronic structure calculations helps us unveil the molecular mechanisms underlying their response and efficiency, as well as providing a starting point for their continuous improvement. 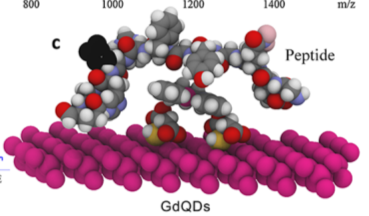 In the first paper, CdTe Quantum Dots (QD’s) are used to visualize in real time cell-membrane damages through a Gd Schiff base sensitizer (GdQDs). This probe interacts preferentially with a specific sequence motif of NHE-RF2 scaffold protein which is exposed during cell damage. This interactions yields intensely fluorescent droplets which can be visualized in real time with standard instrumentation. Calculations at the level of theory M06-2X/LANL2DZ plus an external double zeta quality basis set on Gd, were employed to characterize the electronic structure of the Gd³⁺ complex, the Quantum Dot and their mutual interactions. The first challenge was to come up with the right multiplicity for Gd³⁺ (an f⁷ ion) for which we had no experimental evidence of their magnetic properties. From searching the literature and talking to my good friend, inorganic chemist Dr. Vojtech Jancik it was more or less clear the multiplicity had to be an octuplet (all seven electrons unpaired). As can be seen in figure 1a the Gd-N interactions are mostly electrostatic in nature, a fact that is also reflected in the Wiberg bond indexes calculated as 0.16, 0.17 and 0.21 (a single bond would yield a WBI value closer to 1.0). PM6 optimizations were employed in optimizing the GdQD as a whole (figure 1f) and the MM-UFF to characterize their union to a peptide sequence (figure 2) from which we observed somewhat unsurprisingly that Gd³⁺interacts preferently with the electron rich residues. This research was published in ACS Applied Materials and Interfaces. Thanks to Prof. Vojtech Adam from the Mendel University in Brno, Czech Republic for inviting me to collaborate with their interdisciplinary team. The second sensor I want to write about today is a more closer to home collaboration with Dr. Alejandro Dorazco who developed a fluorescent porphyrin system that becomes chiefly quenched in the presence of Iodide but not with any other halide. This allows for a fast detection of iodide anions, related to some gland diseases, in aqueous samples such as urine. This probe was also granted a patent which technically lists yours-truly as an inventor, cool! The calculated interaction energy was huge between I⁻ and the porphyrine, which supports the idea of a ionic interaction through which charge transfer interactions quenches the fluorescence of the probe. Figure 3 above shows how the HOMO largely resides on the iodide whereas the LUMO is located on the pi electron system of the porphyrine. This research was published in Sensors and Actuators B – Chemical.